What Does the System Include? 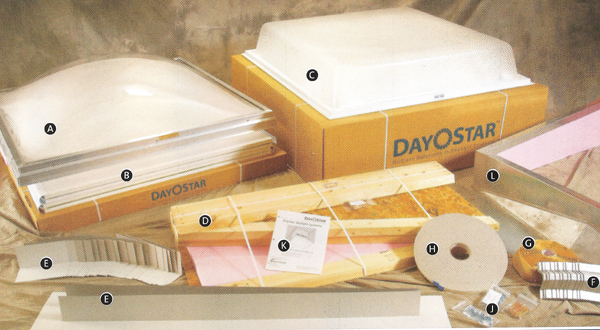 DayStar Skylight Systems are offered as a package, complete with a fully illustrated installation manual. Designed for installation by both do-it-yourselfers and construction crews. Each package contains the materials needed for you job. 4' x 4' - 2' x 4' and 2' x 2'. We offer more than 150 curb styles to fit shingle, metal or membrane comercial roofs with pitches from 0 to 12/12. One piece light shafts up to 12' long come pre-fab with corners attached. We also custom-manufacture to your specifications.